Today I have a very unusual DIY to say the least. This idea has been swirling around in my head for quite sometime and I finally got it all put together. As you can tell by the title, today I'm going to be showing you how to turn eyeshadow into paint. It might sound a little weird but trust me its fun! Before I began experimenting with this idea, I did some research to see if anybody else had done a tutorial for something like this. 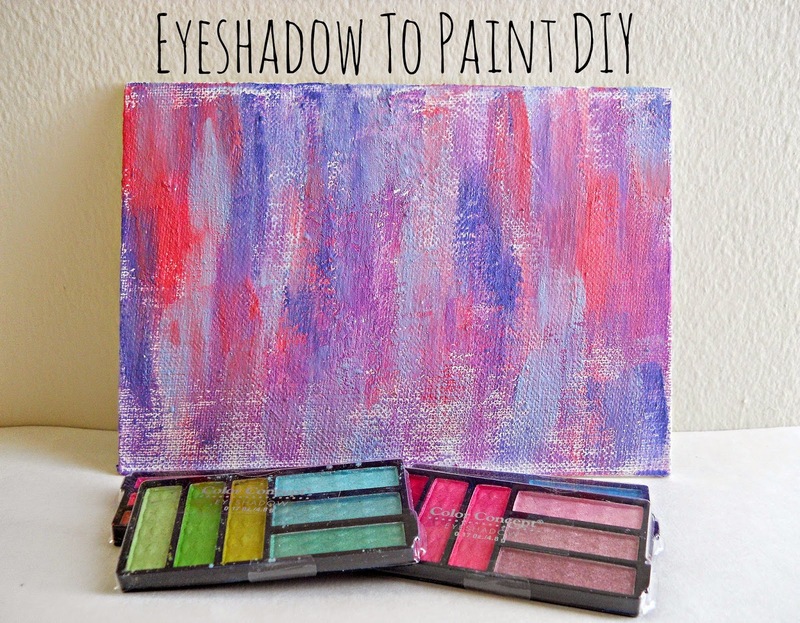 The only thing I could find was tutorials (like this one) which showed you how to turn eyeshadow into watercolors. Now I have nothing against watercolors but I wanted my eyeshadows to be more like acrylic paint. So if your interested in watercolors I would definitely check out the tutorial I linked. When I was experimenting with this technique, I used what I had on hand in my craft supplies. I didn't go out and buy any fancy products or painting mediums. I just wanted to make this project as super simple as possible. So this technique could easily be improved and experimented with further. Also for this project I didn't used a very expensive type of eyeshadow. I used Color Concept which is a fairly inexpensive brand and was something (as you can tell from the photos) I had a lot of. I wouldn't use your best/favorite eyeshadow for this project. If you have a color that your not loving anymore or have an old palette that you don't use, then it would be perfect for this project. Also by no means is this eyeshadow to paint ''professional paint''. I wouldn't use it on any ''important projects''. This technique (I think) would be great if your into mix medium and wanted to add something a little extra to a Smash Book or to mix medium type painting. In this tutorial I show you want it looks like on a small 5 by 7 canvas (which would be great for a weekend project). Ok, after all my rambling, lets get crafty! Step 1: With your toothpick, scrape out the color of eyeshadow you want to use onto a paper plate. Step 2: Put about 5 to 7 drops of textile medium on the same paper plate (picture 1). Then mixed the eyeshadow and textile medium together (picture 2). Keep mixing the two together until it smooth without any ''crumbs''. You may need to add more or less textile medium depending on how much eyeshadow you used. Step 3: Now put about 3 to 5 drops of white paint on your paper plate and mix it into your eyeshadow (picture 2). Also you may need to add more or less white paint depending on how much eyeshadow/textile medium you mixed in step two. Once your happy with the ''look'' of your paint, your ready to use it in your project. After I was done turning my eyeshadow into paint, I used it to paint a small abstract painting. I loved how it turned out and by the look of it, you wouldn't know it was eyeshadow. You can compare this painting to my Chain Canvas DIY (where I used actual acrylic paint) and see some similarities. What do you think? Do you like this eyeshadow to paint DIY? Leave your thoughts/questions below! This is a super idea! Thank you for sharing!!!! I'm glad you like the project Adrianne!